In later life, Mendelssohn always opposed the use of the terms ‘Scottish’ and ‘Italian’ for his symphonies in A minor and A major respectively, as if to emphasise their qualities as ‘pure’ music. Yet they were directly inspired by his European Grand Tour of 1829-32: from the gloomy ruins of Holyrood Abbey to the sun-drenched landscapes of Rome and Naples, his imagination fashioned masterpieces that have seldom been surpassed for their sense of orchestral colour, vividly brought out here by the period instruments of the Freiburger Barockorchester. Despite their clearly documented origins in his travels of 1829-31, Mendelssohn suppressed any titles or programmes to his 'Scottish' and 'Italian' Symphonies, yet their respective characters are so unmistakable and complementary that posterity has won out. While the 'Third' Symphony (actually Mendelssohn's last) strikes one as undeniably brooding and misty, redolent of northern legends, the Fourth is permeated by the spirit of Mediterranean dance, whether exuberant, refined or folklike. These spellbinding new recordings by the Freiburg Baroque Orchestra under Pablo Heras-Casado are rhythmically alert and abundantly responsive to the music's character, but it is above all the savouring of orchestral colour that distinguishes these performances as special. 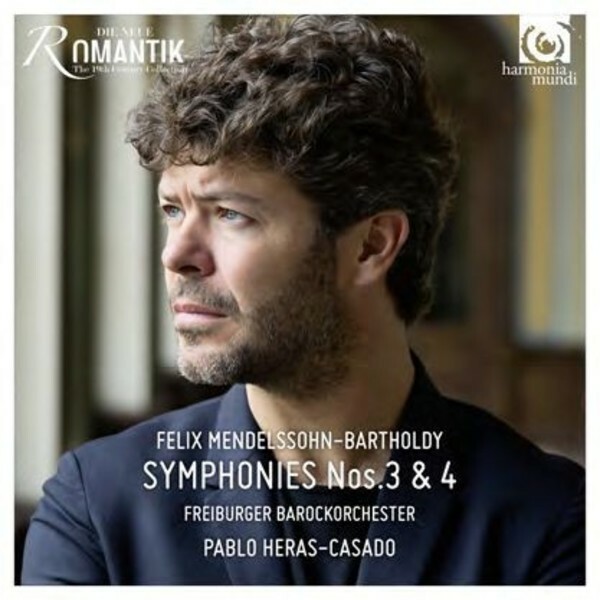 Heras-Casado has already led this orchestra in a highly successful series of Schumann Concertos on Harmonia Mundi, as well as Mendelssohn's Second Symphony (the 'Lobgesang' or 'Hymn of Praise') with the Bavarian Radio Symphony Orchestra and Chorus. Here his performances are consistently buoyant but often surprisingly spacious, affording the listener opportunity to appreciate the changing instrumental timbres as much as the unfolding musical argument. With first and second violins divided antiphonally, the recording illuminates figures tossed to-and-fro, often in a rather more chaotic manner than thankfully happens here. Following the 'Scottish' Symphony's achingly plangent introduction (numbers aren't specified, but the string section sounds fairly small), there's a beautifully sotto voce opening to the main Allegro. While the beginning of the development is delicately posed, it builds with great excitement, and the stormy episode near the close is splendidly turbulent. The listener soon notices a deliciously 'chewy' feel to the textures, enhanced by the relatively close recording: you can really sense the grain in the violas and cellos. It's the middle strings (together with the clarinets and bassoons) that come to the fore again in the scherzo-like second movement, emphasising the music's 'Scottish' flavour - brooding yet dance-like. In the third movement (said to represent Mary Queen of Scots and the ruined chapel at Holyrood), the two main themes - the first hymn-like, the second suggestive of a funeral march - are held in ideal tension, while the conflict-laden finale with its martial figures (timpani taps clearly audible) culminates in a broad yet bracing coda, topped with braying horns and trumpets. The delight in instrumental colour continues in a bracing account of the 'Italian' Symphony. The first movement is sunlit, but not uncomfortably so: mid-morning rather than noonday sun, and certainly without the superficial sheen that disfigures some performances. If the second movement represents (as some commentators would have it) a procession of pilgrims, then it's one with a fairly brisk tread here. The third movement minuet is poised and graceful, and the real high spirits are saved for the Finale, a brilliant all-minor-key combination of Salatarello (a 'leaping' dance) and Tarantella, in which the animated high woodwind and strings excel themselves. The mature Mendelssohn expended a good deal of effort on these two symphonies, and was never entirely satisfied with them, but in these new recordings they sound freshly minted and as musically rewarding as ever, worthy successors to such youthful masterpieces as the Octet and the Midsummer Night’s Dream overture.